Sometimes the biggest joy comes from designing interiors with the smallest of spaces. 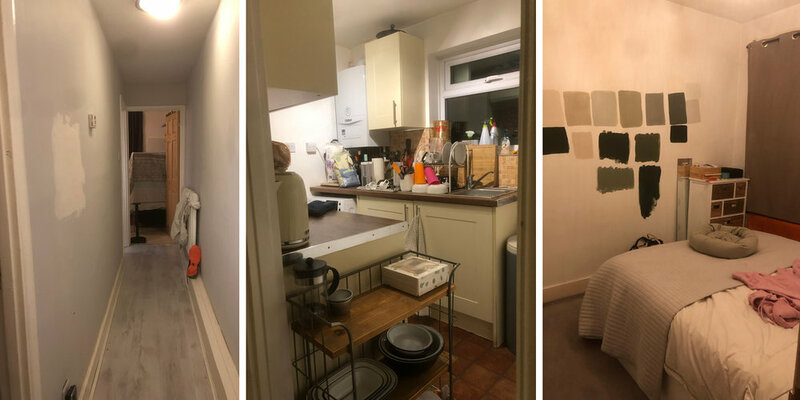 Craig and Sian approached Space Shack last November to renovate their one bedroom groundfloor flat conversion in Walthamstow in North London, after getting married a few months before. They needed a new home for their new life together, and fast! Once we had sign off in January of this year, the entire project took us only five weeks to complete. We do projects in various sizes these days, so it was a great opportunity to return to the challenge to redesigning a small space, and flex our creative muscles in reimagining this first-time buyer home. The one thing that excited us the most was our client’s love of bold colours, and we were incredibly grateful for Craig and Sian for allowing us to suggest some options for their new home based on their favourite bold colours. A vibrant deep blue scheme and an accent colour of orange was created for the living space, along with neutral shades of green incorporated into the kitchen and bedroom areas. Many people are afraid of using strong colour statements for smaller rooms in case they make interiors feel even smaller. I personally feel the exact opposite, as with the right colour palette your home can be lifted from something drab and pokey, to an eyecatching canvas that frames your interiors and injects some much needed personality. One bold move we made, to immediately give the kitchen more space it deserved, was to remove the kitchen door and knock through the existing kitchen side wall. The floor was also terribly uneven, so to give this new found space some continuity, we ripped it up and lay down a brand new one, this was done all the way to the main living area which also needed to be re-plastered and damp proofed, with new radiators and vinyl tile flooring put in. In many large London Victorian houses that have been split into two separate apartments, the kitchen space is usually sparse and almost none existent. It was important for Craig and Sian to have their first dining area, as previously they had always eaten on their laps on the sofa. They wanted their new kitchen to be an area of their home where they could socialise, so a multiple purpose seating area was an important addition to the design brief. We started by removing an entire kitchen wall and stripped out the current units and replaced them with classic matte grey cabinets from Kutchenhaus and white quartz worktops by The Marble Group. We use Honed Green from Paint & Paper Library by Riba on three of the main kitchen walls which was offset by the Silver Thistledown grey hallway walls by Valspar, and a splash back made from matte white square tiles, with matte black beading and light grey grouting. The dual-function laminated breakfast bar also by Kutchenhaus, operates as an additional main preparation surface and breakfast bar. Hiding the washing machine and two sleek Hay bar stools underneath, immediately freed up space whilst creating a spontaneous dining area in a room previously so small, you couldn’t even imagine having a cup of tea in it. All appliances were from CDA with an boiling water tap by Victorian Plumbing, and the vinyl tiled herringbone flooring was from Moduleo. We decided to add additional exposed storage by adding laminate bespoke shelving and a wall mounted wire shelving unit by Cox & Cox, allowing you to put choice decorative pieces and easy access items like herbs and cooks books on display. This also helped balance out the storage and stopped the cabinets from being too overbearing. As Marie Kondo would say, we wanted everywhere you looked in this room to ‘spark joy’. After presenting various colour swatched, Craig and Sian eventually chose Some Starry Night from Valspar Paint as the main colour backdrop to the living room, opting for splashes of tangerine, terrazzo and natural greenery to pull the interior look together. The stone grey sofa from Camerich UK, a flat weave West Elm cream rug, and Marie Michelsen Terazzo cube side table helped anchor the dramatic explosion of colour. A Hem Hide cylindrical side table from Opumo in orange powder coated steel, a large orange velvet cushion from Heals , and a large chunky knit throw by Debenhams UK were the only splashes of brightness needed to convey the personality of Craig and Sian in their newly designed interior. 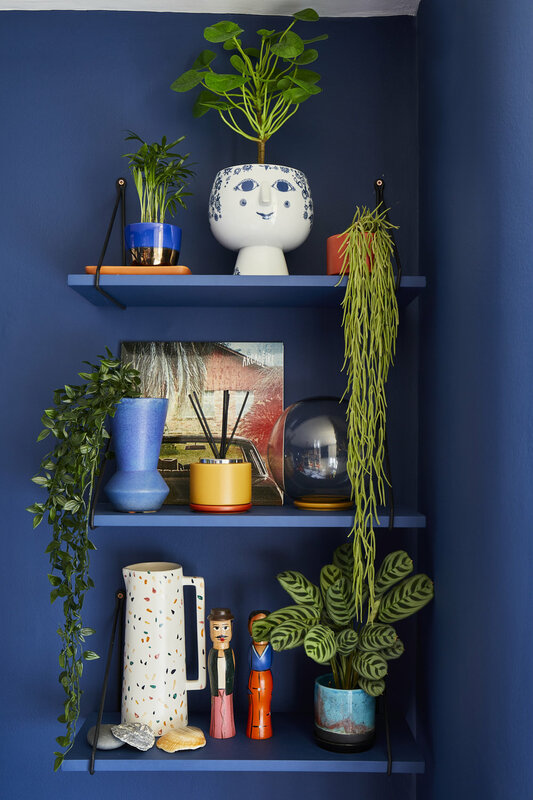 Other furnishings in bright blue included blue geometric and pattern wool cushions from Heals and Swoon Editions, in addition to some decorative vases displayed on handmade shelves mounted against the wall with brackets from Trouva. My favourite finds for this room include a small exposed filament bulb side lamp from H&M Home, a ceiling pendant light from Spark & Bell, and some elegant cotton branches and faux foliage from H&M Home and Abigail Ahern. These elements together, brought a touch of nature, along with a spark of eccentricity to complement Craig and Sian’s old school vinyl record player and collection of amazing customized framed prints and illustrations. Inside the bedroom, we got to do some colour blocking by using a combination of Valspar paint colours: Thunderbolt Green and Nature Lover Green. Dividing your walls with colour is trend seen in many homes right now, and it allows us to embrace a new a completely new modern aesthetic. We finished this room interior by adding a military green side table from Kartell to connect with the side table in the living room. Introducing plant life into a small apartment which doesn’t get a huge amount of light in certain rooms can be tricky, as most greenery no matter how hardy they may be, still need a certain amount of natural light. The bedroom unfortunately had only one small window which faced the wrong way, so our solution was to buy Abigail Ahern faux foliage and hang them from the corner to complete the look. We combined real plants from IKEA, along with artificial versions throughout the home to add an element of calm and tranquility. We are over the moon our newly wed couple can now enjoy their flat conversion which not only breathed new life, but also some vital new inches to their home. Remember to be brave and let your decor pop, utlise vertical storage, and invest in dual purpose furniture. Most of all though, don’t sacrifice great style for functionality just because you’re short on space. With thanks to Chris Snook at Snook Photography.